As we head into autumn, we’re on the lookout for some tasty, comforting dishes to keep us warm! 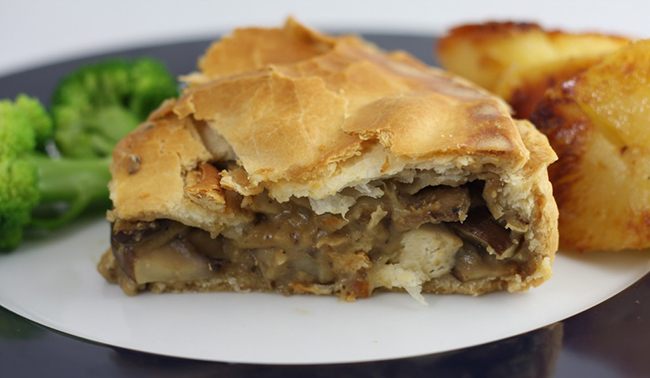 And this tofu and mushroom pie is just the thing! Roll out the pastry to fill the pie case, prick and blind bake for 10 mins at 180 deg C to cook the pastry. Set aside. Fry the onion for 5-8 mins until translucent and then add the pressed and cubed tofu. Allow to fry for a few minutes to seal and then add the garlic and mushrooms. Continue to fry on a medium heat until the mushroom’s juices are released. Add the flour and arrowroot powder and mix carefully until everything is coated and there are no lumps of flour. Add the soya milk gradually, stir continually until all the milk is absorbed each time. The sauce will thicken up as you stir. Try not to break up the tofu cubes. When you have a thick sauce, add the dissolved stock, thyme and tamari and continue to cook until the sauce is bubbling. Season to taste with sea salt and freshly ground black pepper and remove from the heat. Fill the prepared pastry case with the mushroom mixture and cover with the pie lid. Seal with soya milk and pinch the pastry together. Brush the top with some more soya milk and make a hole in the center for the steam to escape. Bake at 180 deg C for 30-35 mins or until the pie case has browned on top. Enjoy with mashed or roasted potatoes for that extra bit of comfort and steamed dark green veg; broccoli, peas, spinach or kale, all the greats.